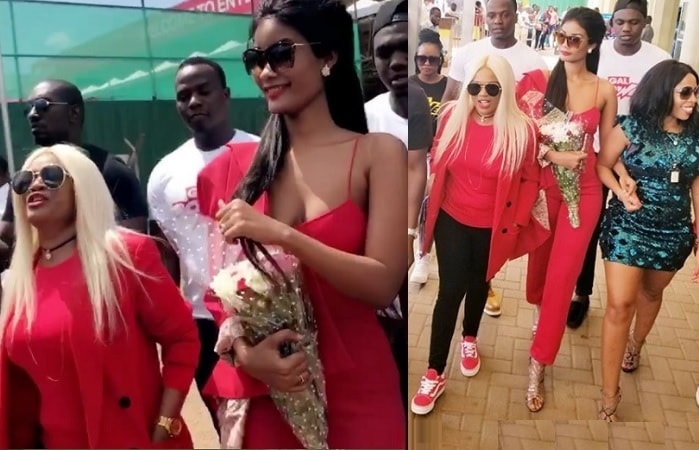 Diamond Platnumz' second baby mama, Hamisa Mobetto, is in the country after landing safely yesterday. She was warmly received by her host, Sheila Nadete aka Don Zella and former Shadows Angels crew member and writer, Patricia Sewungu. All is set for tonight as Platnumz' baby mama's show off who is who when it comes to pulling the crowds. No doubt, both parties will have patrons coming through as partiers are all out there looking for where the action is. Zari was yesterday engaged in charity activities which got her camp members hitting at Mobetto's. Proceeds from the Gal Power Party will go towards charity. ''Zari gives out without begging, but you are begging and giving out to charity," A source from the Zari camp noted. For these parties to make real sense (to some), there has to be a big spender who either offers drinks on the house and partiers crawl back home, or better still, dish out green bucks in the air, the organisers of the Gal Power Party had strategically positioned the new tycoon in town, Brian White for that purpose, but all those hopes have since been dashed from the time he was arrested for attempted murder. Sheila Don Zella has since replaced him with herbalist, Sophia Namutebi commonly known as Mama Phiina, she is equally good when it comes to giving out dime, she recently did wonders to fast rising star, Fik Fameika at the just concluded Abryanz Style and Fashion Awards, she showered the Kutama singer with millions.